The names Gucci and Birks are pretty hard to resist when they appear on an invitation, which was exactly why I found myself at the Birks downtown flagship store yesterday evening, celebrating the opening of the Gucci GRAMMY Traveling Exhibit. 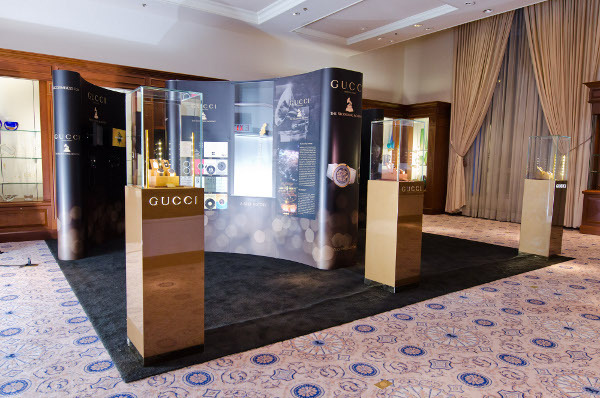 Featuring multimedia installations and select pieces of memorabilia from the GRAMMY Museum, the traveling exhibit is just one of many projects arising from the three-year partnership between The Recording Academy and Gucci. 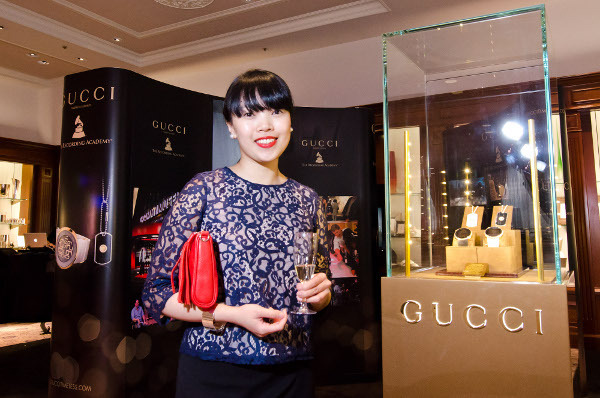 Earlier this year, Gucci released a special edition GRAMMY jewelry collection featuring luxurious timepieces and streetwise dog tag pendants at its centre. They also funded an initiative to preserve more than 20,000 master recordings of music found in a South Carolina warehouse. These recordings, which date back to 1934 and range from jazz to early spiritual, represent a rich epoch in American music. Aside from ogling guitars formerly owned by John Mayer and Eddie Van Halen, I had a great time admiring the Gucci fine jewelry and watches on display. And lucky me, I even had the chance to try on some pieces! Not a shabby way to spend a Thursday evening after work. These sterling silver pieces were inlaid with real pieces of bamboo. This $29,000 white gold bracelet featured a clasp encrusted with 5 carats of diamonds. You know, no biggie. Gucci's signature horsebit motif made for some beautiful gold chain link jewelry. What I wore: H&M lace top, CiCi pencil skirt, Roots red clutch, Joe Fresh pearl stud earrings, bracelet from Boudoir Yaletown, MAC lipstick in 'Lady Danger'. Photo by Thomas Buchan. The traveling exhibit is at the Birks flagship store (corner of Granville and W. Hastings) until Thursday September 22, and then it's off to another jeweler. But luckily for Gucci fans, the fine jewelry collection will still be available at Birks after the exhibit's gone. Special thanks to Gucci and Birks for the invitation to this event! That looks like such a fun event! The jewelry is gorgeous- I love the white gold bamboo and gold horsebit bracelets. Also, you looked lovely: that lace top is so beautiful paired with the red clutch. Very elegant! Have a great weekend and hope to see you soon! I love the bamboo bracelet. Someday I'll own a Gucci bamboo watch! Love your lace top - you look gorgeous!